I woke up this morning knowing I had too many things to do. I have done a lot so far, and accomplished very little of what I actually had planned. The important things are getting done like ordering buildings for our childrens home, but my office may never get cleaned and organized. Not on the list was meeting with Pastor Daniels and the tax consultant over the progress of tax exempt status for our school. The consultant came at a great time because I was suppose to pay my quarterly Kenyan taxes 3 days ago, oops. I rushed out to the bank to get a bankers check to send back to Nairobi to pay our taxes. I withdrew from the Barclays ATM like I always do (no fees), and then went inside to convert the money into a bankers check. It was going to cost a hefty 1,250 shillings ($15). Teller: I need a Kenyan National ID. Me: This is a Kenyan National ID. Teller: No, that is an alien certificate. Me: Yes, they do not give residents “National ID’s.” They give them alien certificates which is equivalent to a National ID. Teller: No, I need a valid Kenyan ID. 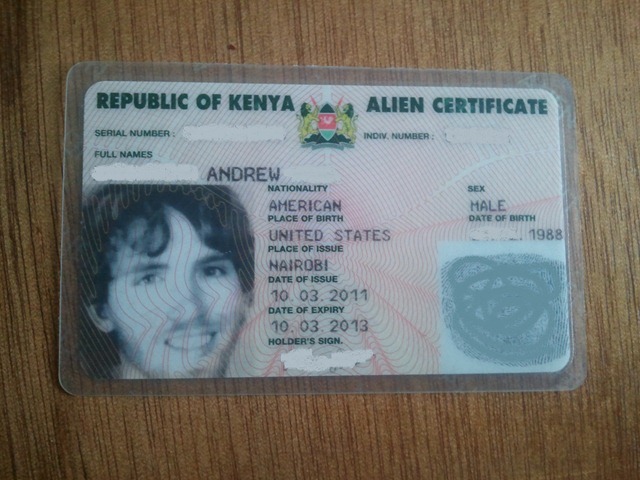 Me: This is a valid Kenyan ID. I use it all the time it was issued by the government as my official identification card. I cannot get anything else. He eventually told me to go get my passport. I was extremely frustrated because I was trying to hurry and get back so the tax guy could return to Nairobi, but I was glad to go. I drove to Co-Op Bank where our ministry accounts are. I had the check in 5 minutes and it only cost me 200 shillings ($2.40). I thank God for sending me to a teller more stubborn than I am. He saved me over $10, and the story gets better. While I was arguing with the teller, Pastor Daniels was waiting with the tax consultant. They have known each other for years, but normally they finish business and then he goes. Pastor Daniels took the opportunity to tell Shadrach the gospel. I arrived back to them reading verses together. Shadrach attends a Salvation Army church in his hometown and has always said he was saved, because he wanted to be, but no one had ever explained how to be saved. Great report!!! God is good!!!! !